Weekend is waiting list only! When a division closes, we will post it! A Schedule will sent out approximately 2 weeks before the Tournament starts. NO Schedule for a Weekend will be sent unless all teams have submitted a USA Hockey Roster, Application and Full Payment. We can NOT take scheduling requests due to limited ice availability. Our plan is to have a division for Red, White & Blue at Squirt/10U (3 divisions). We also plan on having both a White & Blue division at Peewee & RWB (no RED). There will be ONE Bantam Blue division (4-6 teams) and (hopefully) TWO Midget divisions (16U/weaker-younger & 18U/stronger-older). Teams will be placed based on independently verified information (league websites, rosters, etc.). * Squirt/10U, PW/12U, Bantam/14U, Midget 16U & 18U, and Girls 16U nonTB: We will form divisions based on the strength of the teams who register with the goal of 3 to 6 divisions each weekend with 4 or 6 teams per division. 3 Game Minimum plus Skills Challenge. ** RWB 8U White & Blue: Teams must register for the level they played in during the 2018-19 season or a higher division. Teams must specify the division at registration & provide information for accurate placement. This is a competitive Tournament with scorekeeping and Gold/Bronze Championship Games. All teams will play four ½ ice games. 6 team divisions will have a Gold/Bronze/Consolation game for the 4th game. 5 team divisions will play a 4 game round robin and top 2 go the Gold game. 4 team divisions will have a Gold/bronze game for their 4th game. Girls non TB 16U – these teams should be mixed 14U & 16U teams who are NOT TB. 3 Game Minimum plus Skills Challenge. Midget 16U & 18U Divisions - our goal is to form divisions for both 16U and 18U House/Rec teams. We only accept teams if the divisions formed have teams of compatible strength and age. This Tournament generally begins closing divisions shortly after January 1st and we need to make an ice commitment no later than February 1 so Teams are encouraged to apply EARLY! This is a House/Rec level Tournament! Sanctioned for USA registered Teams Only. Generally all teams in this Tournament are the last (or second last) picked team(s) at an age level after the Tournament Bound, Travel, or "Competitive" teams are picked. No Combined or Select Teams unless approved by the Tournament Director before acceptance. All players MUST be on your USA Hockey Roster! NO EXCEPTIONS allowed per NYSAHA Rules. (Although it is rare, occasionally we cannot fill a division and in this case, deposits will be returned!). Hotel Info posted below! Rules to be posted SOON! Area shopping, tournament hotels and attractions close by. All Tournament Hotel accommodations are to be made exclusively through our tournament travel partners listed below. Any team needing 1 or more hotel rooms must book them at one of the following Tournament Partners using the link provided. All hotels are located within 20 minutes of both rinks. Teams are advised to book early and pay attention to room reservation deadlines. After the dates specified, any rooms left in the blocks will be released for re-sale to other customers. NOTE: if all hotels are booked, please contact registrar@wyha.com for additional hotels! 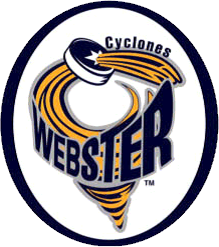 Webster Youth Hockey is delighted to have Visit Rochester's help in arranging these preferred Tournament rates for our teams! $119/per night plus tax. Rate includes 2 queen beds plus breakfast buffet. Pool, Fitness Center & complimentary internet access. Non-smoking and pet free. Address is 1323 East Ridge Road, Rochester NY 14621. 20 Rooms available until 2/1/2018. All cancellations must be done 72 hours in advance. $119/per night plus tax. Rate includes King Suite plus pullout and breakfast buffet. Pool, Fitness Center & complimentary internet access. Address is 460 Center Place Drive, Rochester NY 14615. 20 Rooms available until 2/1/2018. All cancellations must be done 72 hours in advance. Rochester, New York 14623. 15 Rooms available until 2/8/2018. 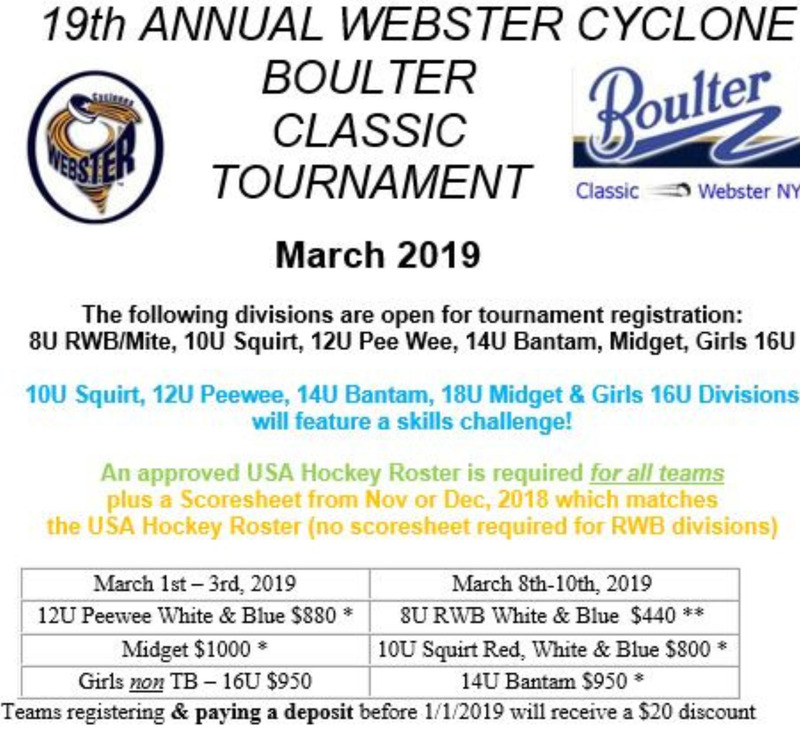 If prefer to book rooms by phone, call reservations at 1-800-228-9290; mention the dates of stay and "Boulter Classic Peewee Midget" and reservations will be able to pull up the information. Check with hotel on cancellation policy. Use Block Code "BCH" or "Boulter Classic Hockey" to get rate. Rooms have 2 Queen Beds. The stay includes complementary hot/cold buffet breakfast (open on Saturday’s 7-10AM unless they have an early game, we can make grab and go bags or make breakfast a little earlier if teams ask), free high speed wireless internet, plenty of parking, easy highway access, an indoor pool (open until 10 PM) & a 24 hour fitness center. 1000 Linden Park, Rochester, NY 14625. 15 Rooms available until 2/15/2018. Check with hotel on cancellation policy. $119/per night plus tax. Rate includes King Suite plus pullout and breakfast buffet. Pool, Fitness Center & complimentary internet access. Address is 460 Center Place Drive, Rochester NY 14615. 30 Rooms available until 2/8/2018. All cancellations must be done 72 hours in advance. 30 Rooms available until 2/8/2018. All cancellations must be done 72 hours in advance. Rate includes 2 double beds plus breakfast for 4. Pool, Fitness Center and free WiFi. Address is 175 Jefferson Road,Rochester NY 14623. 50 Rooms available until 2/13/2018 (this date has been extended by the hotel given teams did not register until late January). Check with hotel on cancellation policy.